The Cincinnati Recreation Commission has signed off on plans to rename East Hyde Park Commons to Officer Sonny Kim Memorial Park. Officer Sonny Kim was shot and killed in the line of duty in Madisonville on June 19th of this year. I was very happy to see this happen as I truly believe that Officer Sonny Kim is deserving of the praise and recognition. He not only died a heroes death, he lived a heroes life. However, he is not the only one. Thank you Mr. Young for the courtesy of a response. I was unaware of all the efforts already made on behalf of our fallen heroes and I did not know that past City Councils were so obtuse to the suggestions. I cannot help but wonder why? It is not as if other streets have not been named to honor someone. We do have Harrison Avenue, Martin Luthor King Drive, and Derrick Turnbow Avenue, to name a few. Are our fallen heroes less entitled? I think of all the city parks, Eden Park would be the best location. 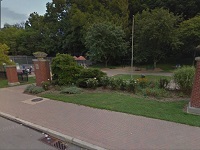 The park is not currently named to memorialize anyone as it is named after the Garden of Eden. Additionally, a start in this direction has already been made because the Viet Nam Memorial is located in this park. Eden park is large enough and has several very beautiful Ohio River overlooks. Moving the current memorial sites to these various overlooks would only serve to help beautify the overlook and bring public attention to the many who have given their lives for this city or for their country. Wendell Young s concern that there are too many and will probably be more is not valid, in my opinion. There are certainly many more streets than there are fallen heroes. If that process would be too overwhelming then I would suggest that at the very least a memorial sign be posted at each and every location where one of our heroes has shed their blood and given their lives while protecting the city and its residents. They died for us. The very least we could do is remember them. Feel free to comment, like, share, agree or disagree with this post. Please consider a free subscription. Options to like and subscribe can be found elsewhere on the page. Thank you for reading the Townehouse Blog. This material may be published, broadcast, or redistributed. In fact, I encourage it. I agree with you Tom and I think all of your ideas are good and plausible too. “Thank you for your email. I appreciate you taking the time to share your ideas with me. I am always grateful to receive citizens input, all fallen heroes should be honored. “. I am providing this update out of fairness to Mr.. Smitherman. as I mentioned in the blog article that I had no response from any of the three. that was true when I published, subsequently I did receive the reply from Mr. Smitherman. Tom, I would appreciate being copied on the responses you get regarding this issue. I would like the opportunity to weigh and otherwise compare the responses. I think that will help define how I should proceed. Again I thank you for bringing this matter to my attention. I think I am serving on a Council that will seriously consider finding a way to more properly honor our fallen heroes. Thanks again. Didn’t mean to post as anonymous. The post requesting to be kept advised of responses to your suggestion is from me, Councilmember Wendell Young.